The Fed meeting just concluded is probably the most important meeting in the 10yrs or so that I have been following the institution. The meeting establishes Bernanke’s legacy, and signals a new direction for global monetary policy (where the Fed leads others will follow). The Fed now has a single point target of 2% for inflation, and publishes the monetary policy (Fed funds rate) assumptions on which the economic forecasts (GDP, unemployment and inflation) are based. All this is in keeping with the best academic opinion on such matters. A point forecast for inflation is easier to explain and easier to understand, and that ought to both stabilise the economy and make monetary policy more potent. An explicit inflation target makes it easier for a central bank to be more aggressive in circumstances like the present. An explicit inflation target reduces the cost of aggressive monetary easing, as it reduces the probability that the monetary authority will lose control of inflation expectations. As a result, it improves the tradeoffs associated with easier policy – particularly when experimenting with non-standard measures at the zero lower bound. Bernanke was careful to say that the Fed has a dual mandate – maximum employment and stable prices (which means 2% PCE inflation). However, the more Bernanke said (he answered a few such questions), the clearer it became that the Fed ‘model’ has only a short run trade-off. Thus, the main influence of the unemployment part of the dual mandate is that it shapes the glide path back to the 2% inflation target following a shock. Again, this reflects the mainstream of academic opinion – there is no long run trade-off, but monetary policy can have short run impacts on real variables. The Fed’s Statement of objectives was not specifically designed to knock the NGDP-target school, but it’s worth teasing out the consequences of the FOMC view about the potential for such a policy given the popularity of the subject. The maximum level of employment is largely determined by nonmonetary factors that affect the structure and dynamics of the labor market. These factors may change over time and may not be directly measurable. Consequently, it would not be appropriate to specify a fixed goal for employment; rather, the Committee’s policy decisions must be informed by assessments of the maximum level of employment, recognizing that such assessments are necessarily uncertain and subject to revision. Translated: the Fed thinks it can hit an inflation target on average over time, but does not think it can reliably influence real variables. The problem with an NGDP target is that it puts an equal weight on something they control, can hit (on average over time), and can measure with something they do not control, cannot hit, and cannot measure. The point target for inflation and the range for the NAIRU reflect the relative ‘controllability’ of these two objectives. The difference between the controllability of the two aims is key when weighing the costs and benefits of NGDP targeting frameworks (or similar). Fiscal and regulatory policy are the main influence on the supply potential of the economy (and hence the NAIRU) – not monetary policy. NGDP target advocates say that it’s basically what we’re already doing, as the policy merely bundles up the full employment and 2% inflation objectives – but as the NAIRU is moved by Governments, such a bundling would necessarily involve regular central bank judgements on the quality of Government regulation – as they these would move NAIRU estimates (just imagine the fights about labour market regulation!). Such politicisation of monetary policy is likely to diminish a central banks independence and therefore their ability to hit their inflation objective over time (and consequently the credibility and therefore efficacy of any monetary policy strategy). In any case, most folks who want NGDP targeting merely want further easing – and that’s what they are probably going to get. The new framework and forecasts have laid the groundwork for a further easing of monetary policy. The Fed cut their near term growth and inflation forecasts between November and January projections, and their forecast of sub-target inflation in 2014 (mid central-tendency is 1.8%y/y) and high unemployment (mid central-tendency is 7.15% v. NAIRU of 5.6%) means that the new framework makes an automatic case for further monetary easing. Why not ease right away? Well, no one is very good at forecasting that far ahead, and the recent data has looked a little better, so the Fed is going to watch and wait for a while. And in any case, saying you’re on hold for longer (the first hike has moved from mid 2013 to the end of 2014) is an easing of monetary policy. If things turn out as they have forecast, I expect that they they will ease further at some point this year — my guess is some time mid 2012 and mostly via MBS purchases. If things are better than they have forecast, they will hold – and of course at the first sign things are flaking out, they’ll ease. It seems logical that this change of policy had its greatest impact on the 5yr point of the US yield curve. Short rates cannot fall further, so it’s the belly of the curve that should rally – and it has done so. At the long end, I think that the Fed’s commitment to 2% inflation, hints that easier policy may be forthcoming, and indication that the long run neutral fed funds rate is ~4% — which is well above long term bond yields (10yr USTs are presently ~2%, and 30yrs ~3.15%) — give reasons for the market to sell off. The 10yrs sector is a tough call, as the Fed might buy more of them; but certainly 5*30 should be steepening. 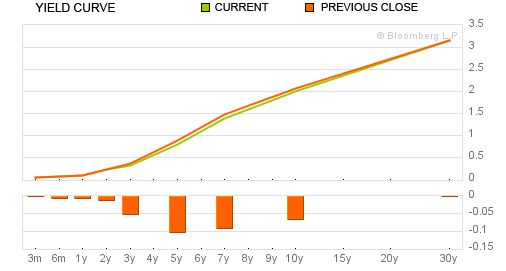 If the economy improves so that QE3 is not required, i think that US 10yr yields should rise (5*10 make sense). I am wary of reading much at all into the TIPS market moves, however the sharp move wider in break-evens over the past few sessions suggests to me that Bernanke has successfully engineered an easing of monetary conditions. To get further easing that is meaningful the Fed would have to increase their balance sheet a lot. Glenn Rudebusch ( of the San Francisco Fed) showed a year or two ago that it would have to be 4-5 times bigger to get artificially where a forward looking Taylor curve said interest rates should be. ( the figure was -5%). I do not see that on the horizon. Something more modest – perhaps 1tn more if they do MBS and USTs. Smaller if it is just MBS. Of course that will grow if the economy is really very weak. 1. Why do NGDP target advocates think that the central banking policy has long run real effects? > The problem with an NGDP target is that it puts an *equal weight* on something they control, can hit (on average over time), and can measure [inflation] with something they do not control, cannot hit, and cannot measure [maximum employment / real output gap]. How would you reconcile this with the CRs interpretation that Bernanke is placing employment & inflation on equal footing in short run? 1/ no idea, but they seem to think that there is some benefit to having higher inflation if there is lower real output – and surely this can only be justified if you think that higher inflation leads to higher real output over some longer run such that you increase the NPV of welfare somehow defined. 2/ i agree that is what Bernanke said – he was at pains to make the point. But i watched the presser and i do not think he means it as plainly as it seems. The model he is talking about has a short run trade off but no long run trade off. The central bank seeks to hit their inflation target, but is constrained by minimising some loss function in unemployment. NGDP target advocates do not advocate higher inflation in long run – only in short run. I noticed that this is was more or less what Bernanke said in his responses to some questions. The second questioner (didn’t get his name) asked why the Fed rate projections suggested increasing rates when projected employment (Y) was below max employment (Y*) & inflation (P) below target (P*) and whether Bernanke had any views on ‘catch up growth’ (I assume questioner meant NGDP). Bernanke dithered in his response. He said that there would be more accommodation if P < P* and Y < Y*, but didn't address how this gelled with the FFR forecast. Neither did he address catch up growth. However, Greg Ipp of the Economist followed this up in fourth question (I think). He asked whether above target inflation would be tolerated if employment was subpar. Bernanke became a bit clearer here and said that "tolerated" was too strong a word. However, above target inflation would be addressed more slowly if the trend for employment wasn't good. The exact trade off would depend on the initial conditions of P – P* & Y – Y*. That something of the kind of stuff that NGDP target advocates have been pushing for – above target inflation in short run to "grease the wheels" for employment to recover – all in the short run. Bernanke is definitely more cautious in putting this out there and definitely not prescriptive about it. I think he is noble in this – not wanting the inflationary anchor to become unmoored and all that. Indeed, one of his responses jarred me when he stated that current employment was "comfortably above" assessments of max employment. If he was more concerned about it, he would have said "uncomfortably above" max employment. I don't think Bernanke is pushing for an NGDP level target (he's got himself a medium term inflation target). But I think what he is proposing is ipso facto moving in that direction: first mooring expectations by releasing central banking projections, equal and symmetrical consideration of employment & inflation (i.e. no Taylor rule – it's dead) and possibility of above target short run inflation. Those things have faint echos of a level NGDP target. And finally as per Sumner, if the Fed can move employment closer to max employment, *some* structural issues will probably start disappearing – for eg, congress will likely drop unemployment benefit term from 99 weeks, business might be willing to bear greater cost of retraining idle labour, etc. These things are endogenous. Finally, I think one of the most interesting Q&A came from a question from Zac of WaPo. In his response, Bernanke indicated that he thinks there is some cause for concern that the transmission mechanism supporting QE hasn't been as effective as they expected. I would add the effect they have had on collateral markets has been quite negative. He also stated that there are other tools the Fed can use (aka "we're not out of ammo") but didn't specify this as they were still being discussed, debated and considered. It will be interesting to see what these other options are. My understanding of his ‘tolerated’ answer was in terms of the Fed’s constraint on hitting their 2% inflation target – meaning that they will not push unemployment up by trying to get back to 2% inflation quickly following a shock. The dual target stuff is just parroting of their mandate – there is no flexibility on this issue. The meat of what he said is that inflation is set by monetary policy, and that the NAIRU is set by congress. True the NAIRU is set by Congress, but no one is suggesting we are close to it. I think Manny is right that things have moved towards the NGDP targeting direction, but an explicit NGDP level target would allow the US to get to NAIRU much faster than a 2% inflation target. The rationale for NGDP targeting is that nominal wages are sticky, so deflation or even stable prices must be avoided at all costs and higher inflation is not a bad thing during slowdowns to ease the reallocation of resources. Wasn’t Australia’s looser inflation target nominated for this very reason? I reckon Australia’s higher inflation target is part of the reason (as well as supply side factors) Australia did better than NZ in the 90s. I agree, a 2.5% inflation target is better than a 2% target (especially if you only update the basket every 5yrs) – but i do not agree that we ought to have a variable inflation policy. That is what an NGDP target policy amounts to – either in levels or growth rates. I am not convinced that this would be a better policy over the long run – in part because i am not convinced it would work to smooth real outcomes once the public understood what was going on, and because i think that the operational and political aspects of the policy are also difficult. Better to have a slightly higher fixed target. This isn’t my idea – Blanchard for example has argued for a 4% target. Going from a blurry inflation and unemployment policy to a fixed point inflation target with a blurry unemployment constraint doesn’t seem like a step toward an NGDP targetting framework to me. 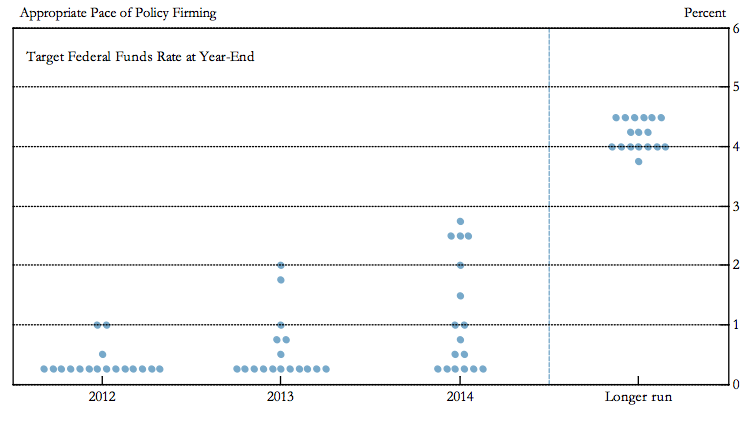 Don’t you think monetary policy implementation is partly ninja art? Namely, do what I tell you to, otherwise I will hit you with a stick? This is the case with traditional short rate targeting central banks: I doubt they do enough OMOs to get rates to target rate. They just say what rate should be and the market moves there. No one bets against the central bank. NGDP targeting is the ultimate ninja trick: use a stick to get AD to where you want it to (aka level target or growth target). Ideally it wouldn’t need to use the stick much at all (like traditional short rate targeting central bank). Agents just believe the central bank will use the stick effectively when it does use it and so they behave as though the target will be met. 2/ Does the Fed have the ability to move real variables in the short run? Yes. If it didn’t then you wouldn’t need central banks running counter cyclical monetary policy even in this framework. 3/ Does the Fed have the ability to move price levels in short run? Yes. No one doubt this. Take extreme case: the famous Bernanke cash drop from a helicopter. Is inflation going to ignite in this instance? Absolutely, 100%. So work your way back from that cliff to some more sensible scenario. It seems to me, in the short run, that central banks have the ability to use stick and enforce its target. This suggests to me that they could be as successful under NGDP level / growth targeting regime. So, what happens if the real economy is in really bad state and NGDP level target leads to persistently high inflation? Well you would get 5% p.a. and no more. Is that terrible? Probably. But as you point out Blanchard wants 4% target. So 5% isn’t that far off. But the clouds have a silver lining. If you have persistent 5% p.a. inflation, then that would send a very strong signal to public and policy makers that structural changes need to be made. Of course, there would be political issues. But, listening to Ben answer questions on savers being hit by inflation of even 2% p.a. suggests that the central banks are going to get practice doing this when PCE inflation > 2%. They can sow the seeds of this in public’s mind before it happens so when it does, the public will understand what is going on. As to your point about public seeing through higher inflation: that’s possible I guess. I’d like to think this through a bit more. But my initial thought would be that it would be foolish for a worker to demand expect 4% inflation growth and have wage demands in line with this, when the real economy is stagnant and his fellow workers are happy with a 1% wage increase. However, if the real economy isn’t in structural tatters then this shouldn’t be a big problem: inflation should be close to 2% and wage growth in line with this. As far as I know very few people think the US or other developed countries real economies are dead. They are still productive and innovative and capitalism hasn’t been completely neutered. They need a kick start. And hopefully that kick start will snowball into easy of structural constraints etc etc. Re risk allocation, Lars Christensen argues that NGDP level targeting is Pareto optimal. magic mesh Great synopsis of commenting and how to very well written and all that link love you just poured out, great post, if this was a forum you would have a sticky on this.